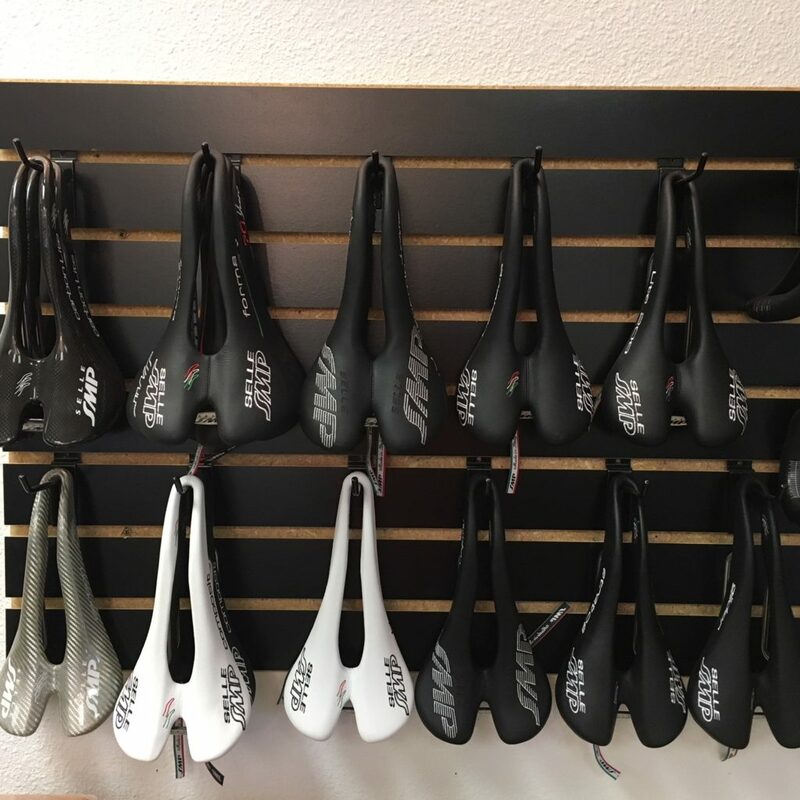 Italian manufacturer SMP manufactures saddles with base shapes that more closely match the shape of the human ishium than most other saddle designs. This feature makes the saddle an excellent platform for a rider to generate power. Setting up a saddle that reflects the shape of skeleton more accurately requires more precision than a saddle with a less specific shape. When saddle setback, angle and height are all precisely adjusted, and the correct model is selected for the rider, the saddle will completely disappear under the rider. This is the end goal of any saddle fitting. The nose angle should be set as low as possible, provided the rider is stable. When a rider is stable on the saddle, its possible to ride in the drops for long periods of time (20 or 30 minutes) on a false flat downhill under moderate power (high Z2 or Z3 pace) without doing “The Typewriter”. When a rider is not stable in the saddle, under moderate or full power, they will scoot towards the nose in small increments, and into under-extension, until they are forced to correct their position with a giant movement backwards. This cycle is repeated and power is lost during all the moving around. The lower the nose angle, the easier it is to rotate the pelvis forward and engage glut. The saddle nose is too high if the athlete feels pressure in the front of the crotch, provided they are seated in the “trough” of the saddle. In a saddle with significant curvature, there is only one correct place to sit, at the bottom of the “trough”. Scooting further back, there is a “wall” and scooting further forward puts the rider on the “ramp”. If the rider feels pressure in front, first make sure the rider scoots back to be seated in the “trough”. If the rider consistently scoots forward onto the ramp, the saddle may be too far back behind the bottom bracket and may need to come forward 5mm on the rails. If the rider is seated in the “trough” and still feels pressure (especially in the drops), the nose angle should come down in 0.2 degree increments. A small adjustment can make a big difference. The nose angle should between 0 and 5 degrees nose down in most cases, and roughly proportional to the saddle-to-stem drop as a starting point. The better a rider is at rolling the hips forward and sitting on the bike with an extended spine, and the lower the stem is relative to the bars, the more towards 5 degrees the saddle nose should be. The true finalization of saddle angle must be done riding outdoors, as no indoor trainer or rollers accurately simulates road load. Subtle changes in a rider’s pedaling style will influence bike posture on the trainer, which can lead to a perception of stability on the trainer which does not exist in outdoor riding. Get it close and then let the final test be over a week or more of riding in real world conditions. In the absence of a digital level, an “Angle Finder” application can be downloaded for your smartphone in order to set up saddle angle with precision. Place a level object (such as a rigid book or wide ruler) across the top of the saddle and measure angle with the phone on this surface. Some things to remember: make sure your bike is on a level surface, or the saddle angle will be meaningless. Use a four-foot dowel or other long straight object and lay it next to the wheels, and use the angle finder to confirm the level of the floor. Also, if your smartphone has buttons or other gizmos on the side which will change the angle relative to the surface to be measured, they must be accounted for, or the other side of the phone can be used for measurement. The measurement is taken from the highest points (the tail and the high point of the nose). Many riders sit further back on a SMP saddle in comparison to traditional saddles. In many cases, in order to keep the same position relative to the bottom bracket, this means placing the SMP 5-10mm further forward than the previous saddle. It depends on the rider and the saddle, and may not apply if a rider was previously riding a saddle that was too narrow. There is some adaptation to a cutout saddle. The nerves under the ishial tuberosities must adapt to carrying the weight of the torso, especially if the rider has not ridden a cutout saddle in the past. This adaptation will vary in length depending on how heavy the rider is, how padded the saddle they chose is, and how much riding they do. A general timeline is one to three weeks. The discomfort can reach a crescendo before adaptation occurs and relief is achieved.